Hi everyone! Welcome to thecatfoodguy.com. My name is Kev and I am the proud owner (or do they own me?) of two beautiful cats. My story starts in Beijing, China. I was working as a teacher in the big city when a friend of mine found a very small 3 week old kitten in the sports shed outside. I decided quite quickly that I was going to adopt this little bundle of joy. After one visit to the vet I made it two little fluff balls after adopting another kitten found on the streets of Beijing. I had never owned a cat before so didn’t really know what I was doing. Unfortunately one of my cats, Dumpling, suffered from irratable bowel syndrome so I found myself having to do copious amounts of research to find the best wet and dry cat food to keep him pain free and healthy. 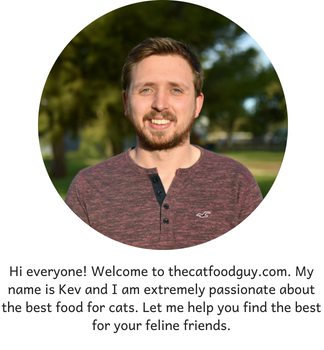 After all that time and trialling different tpyes of food I decided to create thecatfoodguy.com to help all you other cat owners out there make the best decisions for your cats.